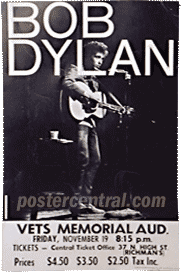 Here are four examples of original, authentic Bob Dylan concert posters from the 1960s. 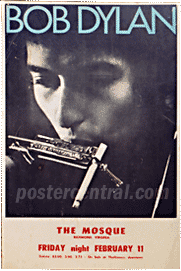 Most serious poster collectors covet vintage Dylan concert posters from 1961-1966, although nothing has shown up from 1961 yet – just handbills. Dylan was all acoustic, of course, up until the summer of 1965, at which point he embarked on a combo acoustic/electric tour that shook the music world for nine months – and forevermore. 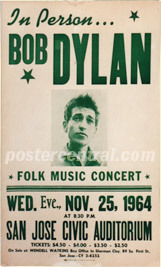 I will pay top dollar for any Bob Dylan concert poster of this vintage! 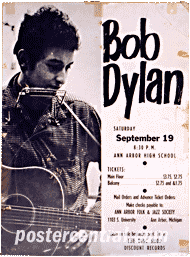 Details on the concert posters pictured above, all original, all printed before the event for the sole purpose of selling tickets: Bob Dylan in concert at Ann Arbor High School in Ann Arbor, Michigan on Sept. 19, 1964; Bob Dylan in a Folk Music Concert at the San Jose Civic Auditorium in San Jose, CA on Nov. 25, 1964; Bob Dylan in concert (with The Hawks, who are not mentioned) in Buffalo, New York on Nov. 19, 1965; and Bob Dylan in concert (also with The Hawks) in Richmond, Virginia on Feb. 11, 1966.